San Miguel de Allende Karaoke: Record yourself singing on Facebook! Karaoke fans, here's a new Facebook page, launched yesterday, on which you can play the karaoke song-of-the-day and record yourself singing along! It's called Daily Karaoke. 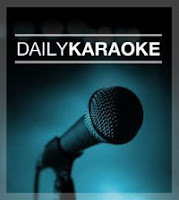 The instructions on the Daily Karaoke page say to use the Facebook Video Recorder or, if that doesn't work (and it didn't for me), you can use your own video camera to record yourself singing, then upload the video to the Daily Karaoke page. To record yourself singing the song-of-the-day, open the song in a separate window and play it while singing into the camera and microphone. If you don't have a microphone separate from the camera, it's not going to sound the best, but try it anyway, just for fun! Open Finder, then click on your hard drive and look for the Library > Quicktime > Google Directory. Empty your trash and restart your browser, and you should see your camera as an option the next time you go to the recorder.